This beginning karate class is structured to offer basic agility and socialization. 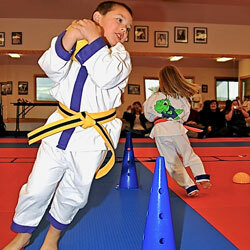 It's a great way for your child to learn the basics of karate while having fun. We understand the problems unique to youngsters, and the concerns parents naturally have. The well organized, professionally planned Lil’ Dragons program is designed to be valuable for parents in the task of building a child’s self confidence, positive outlook and self esteem. They learn to take pride in themselves and their accomplishments, soon come out of their shells and begin to participate. Attention spans increase as do motor skills and performance at sports and other activities. Also, learning how to deal with “strangers” or unusual situations is very important in today’s society and we teach kids stranger safety issues. When it is time for him/her to test for a belt, one of our instructors will tell you in advance. Our main goals are to have your child benefit from individual and group physical activities, encourage discipline and respect, learn stranger safety, improve listening skills, follow directions and have fun! Advancing in belt levels is not our first priority in the Lil’ Dragons’ program.